DAEJEON -- Kim Mi-hee was born and raised in China until her father married a Korean woman and moved to South Korea in August last year. For the 12-year-old Chinese who transferred to a public elementary school here, the language barrier would have been a big stumbling block in adjusting to school and life here. But thanks to the Korean as a Second Language program provided by the school, Kim quickly managed to raise her proficiency in Korean. Along with Kim, three other students -- a brother and a sister from Mexico, and a 12-year-old who has a Korean father and Filipino mother -- were reading out loud sentences written on the white board in front of the KSL classroom at Sannae Elementary School when The Korea Herald visited. Excitement and laughter filled the 50-minute class as the four students eagerly raised their hands to talk about their thoughts and answer the teacher’s questions. Sannae Elementary School in Daejeon is one of the multicultural preparatory schools designated nationwide by the Ministry of Education that has special classes and teachers providing KSL lessons and counseling for students with foreign or migrant backgrounds, in addition to the regular curriculum. At the school, 13 students attend regular classes and KSL classes. They are also offered one-on-one lessons on the subjects they have fallen behind in, such as social studies. The school currently has 27 students from international marriages, eight students from multicultural families who transferred from other countries, and five students from North Korea. Studies show that many migrant students living in South Korea suffer from a lack of self-esteem, as they are often intimidated by the environment. Therefore, multicultural preparatory schools supported by the Education Ministry also offer counseling to multicultural students. “We try to counsel the students regularly and monitor their emotions. They may have difficulties adjusting to a new environment and also, in some cases, the migrant students have family issues. We wish to help them,” said Lee Sook-hee, the teacher in charge of the multicultural department of the school. In 2012, the Education Ministry selected 26 schools across the nation to launch the preparatory classes, providing them with 1,200 language-teaching faculty members and subsidies. The move came as the number of students from migrant families began increasing at a fast pace. As of 2011, a year before the program was introduced, there were 38,678 students with such backgrounds. The ministry also designated 150 schools, dubbed “multicultural-centered” schools, to provide the after-school KSL program by part-time Korean language teachers. Since then, the number of foreign and migrant students appears to have tripled to record the highest at 109,387 in 2017, according to statistics released by the Education Ministry. Park Chu-an is a student who showed excellent progress in the KSL program and was moved to a regular class this March. Born to a Korean father and a Filipino mother, Park, 14, was raised in the Philippines until he came to Korea for the first time in December 2015. When he transferred to Sannae Elementary school, he appeared to be daunted, Lee said. “The previous teacher who saw Chu-an when he first transferred, was recently surprised to see he confident he has become,” Lee added. Even though he did not know much Korean, Park worked hard with the help of the KSL program and made great progress to score over 90 out of 100 in every school subject. “I was very worried in the beginning, because I had not taught them any Korean. They would also not know much about the Korean culture. Without the special classes, I wouldn’t have known what to do,” Park Bong-hoon, Chu-an’s father, told The Korea Herald. He also has two daughters. As of 2018, there are 223 preparatory classes operating in 129 elementary schools, 54 middle schools, four high schools and 10 other education institutions. While the number of students affiliated with the preparatory classes for this year is to be determined in November, there were 3,600 students at the end of last year, Kim Hyo-jin, an official from the Education Ministry said. Considering that there are also some 900 students that take after-school KSL classes at multicultural-centered schools, the total number of KSL education recipients appears to be about 4,500 -- a small portion of the 109,387. 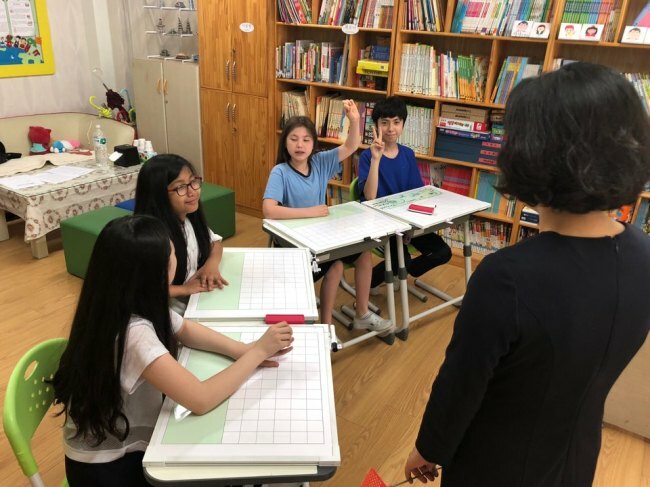 Although policies to support the increasing number of migrant students here are being refined and expanded, there is still a long way to go, says Kwon Jin-young, a teacher at Eoeun Elementary School in Daejeon. Her school is one of the multicultural-centered schools where KSL classes are offered as an after-school program. Eight students there all come from different countries -- India, Pakistan Egypt, Mongolia and Nigeria. Four other students transferred from other countries and one of their parents is Korean. The school runs two KSL courses after school, one for beginners and one for the advanced. Each course consists of two sessions per week. “The students are often isolated and intimidated in their regular classrooms, and the KSL class provides the time to relax and freely express their feelings,” the part-time teacher explained. Educating Korean students on interacting with classmates with a foreign background is also very important, Kwon pointed out. The school held a contest recently on the topic of foreigners and students that have a migrant background. Over 90 percent of the video clips that the students submitted carried similar plots: One day, a foreigner would transfer to their class and the students would distance themselves from the person. Then all of a sudden, they would regret their wrong behavior and start being nice to the transfer student. Furthermore, many students did not appear to view kids from multicultural families as equals, Kwon said. According to research by the Ministry of Gender Equality and Family in 2015, teenagers appeared to show different attitudes toward foreigners depending on the economic status of their home country, and expected them to naturally assimilate into Korean society and culture. The Education Ministry’s policies appear to be shifting from its previous “donating and giving goods and money” to anti-bias education.